Steve Feldman is an assistant trainer with the Philadelphia Eagles. 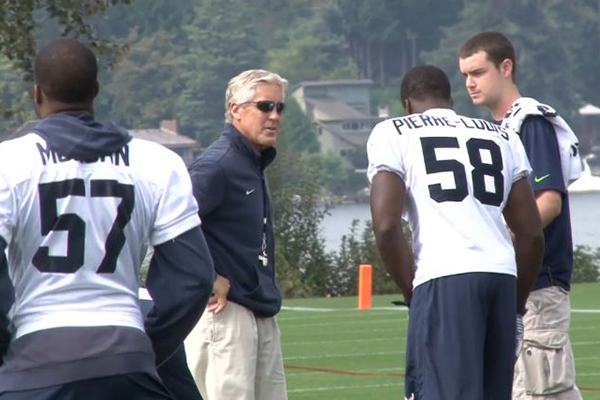 Harrison Grube (right) at a Seattle Seahawks practice. 11:36 a.m., Oct. 2, 2014--The first few weeks of the 2014 NFL season saw stars like Robert Griffin III, Ryan Mathews, and Dennis Pitta go down with play-stopping injuries to arms, knees, hips, and ankles. Athletic trainers are usually the first professionals on the scene when players are hurt on the field, and a number of University of Delaware athletic training students have had a front-row seat to the treatment of injuries in the NFL through internships and full-time employment. The current tally is two alumni working as full-time NFL athletic trainers and three as seasonal interns, as well as eight students serving as summer interns. 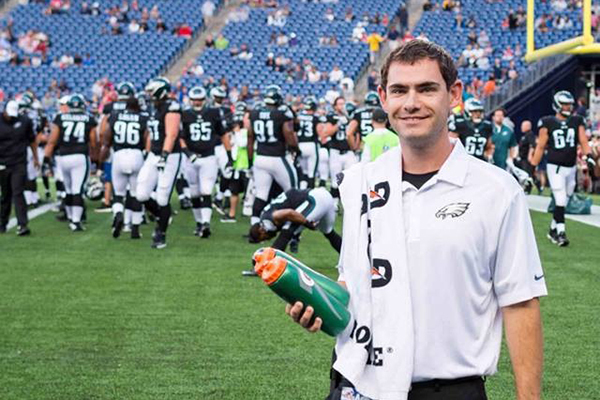 Steve Feldman, now an assistant trainer with the Philadelphia Eagles, graduated from UD in 2009 and then went on to complete a doctor of physical therapy degree at Delaware as well. Kaminski explains that the ATEP program begins with an “athletic training interest” in the freshman year. Once students are accepted into the program as sophomores, they begin working directly with the athletes and are given increasing freedom as they progress through the program. Senior Evan Griskowitz has completed three summer internships with the Seahawks, which he says enabled him to experience athletic training at the professional level and learn from some of the best trainers in the profession. Uriah Myrie, a seasonal intern with the Buffalo Bills, says that it wasn’t until he left UD that he realized how strong the program is. “After spending two summers with the Carolina Panthers and working side by side with students from other programs, I felt that the staff and faculty at UD had prepared me with the tools to be at a great advantage,” he says. Kaminski envisions the NFL connection continuing to expand as the network of UD students and alumni in the league grows.